LED Fairy Lights are our breath taking beautiful range where small LEDs are used inside beautiful decorative items like ornate silver balls, beautiful mesh balls, ornamental stars and hearts that can light up any occasion to give a mesmerizing effect. They are available in a full range of colours and beautiful ornamental designs to choose from. Some are also available in a range of sizes/lengths from 2m to 4m. You can hang them or use several creative ways to use them together with flowers or put them in beautiful bottles to brighten up your home décor or even use on Christmas trees. The newest product in this range is also remote controlled and offers in the one product a full range of LED colours. 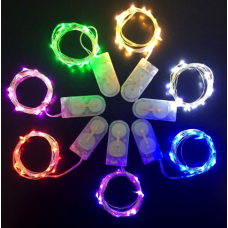 Fairy led lights are great for function decoration and they come in different colours. If you wish to buy led lights online at a greater price then Event Effects is the answer. Beautifully bright, 20 LED seed light along a very fine 2m long flexible silver copper wire. &n..
3m in length with 30 Super bright LEDs along a very fine, flexible silver copper waterproof wire.Ple..
4m in length with 40 Super bright LEDs along a very fine, flexible silver copper waterproof wire.Ple..